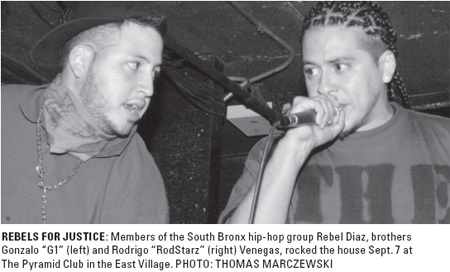 The legal struggle continues for South Bronx-based hip-hop activists Rodrigo and Gonzalo Venegas, who were aggressively arrested by New York Police Department officers June 18. The brothers, members of the popular group Rebel Diaz, said they were trying to help a street vendor on Southern Boulevard in Hunts Point who, they felt, was being harassed by police officers. Rodrigo said that at first the officers agreed, explaining that they were enforcing city health department violations. Soon after, he said that several cops became aggressive, eventually forcing them to the ground and handcuffing them. After spending ten hours in a 9-by-12-foot central booking holding room with 42 other inmates at the 41st Precinct, the brothers appeared in criminal court the following day. A subsequent event complicated matters. On June 24 around 2 a.m., Gonzalo said that three NYPD police officers in full uniform invaded his East Harlem studio without knocking or a warrant. He said that with weapons drawn, the officers forced him, his roommate and a friend to their knees, put guns in their faces and demanded to know who they were, accusing them of harboring a fugitive criminal suspect. Moments later, he said that the officers departed just as quickly as they had arrived, down a side stairway adjacent to the apartment. Once Gonzalo realized what had happened, he ran after the police and was able to discern two badge numbers. The Venegas brothers called several precincts, all of which were unwilling to claim the officers; they still wonder what really happened that evening. 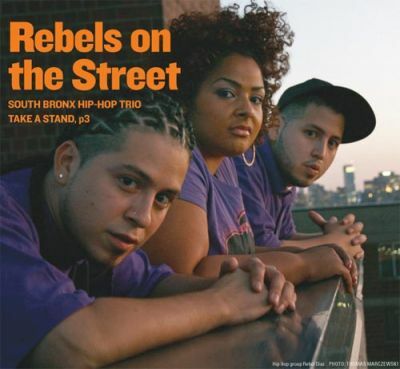 “We feel these are modern-day scare tactics,” Rodrigo said.G1, RodStarz and Teresita Ayala (rap name “Lah Tere”) make up the hip-hop group Rebel Diaz. The Venegas brothers were raised by Chilean political exiles on Chicago’s north side, and Ayala grew up in Humboldt Park, a primarily Dominican and Puerto Rican neighborhood in Chicago. They strongly identify with a long lineage of activist musicians. 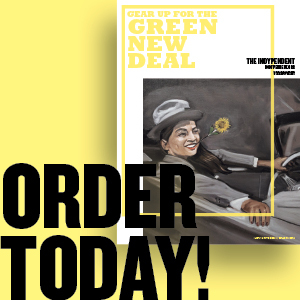 Rebel Diaz’s most recent song, “Bullpen Therapy,” sheds light on the politics of gentrification, which they believe fueled the June 18 incident. Leah Horowitz, a criminal defense attorney with Bronx Defenders, filed for an “outright dismissal” of the charges against the Venegas brothers at their Sept. 3 court hearing. She referenced scores of letters written in support of the duo attesting to their positive work in the community. Judge George Villegas adjourned the hearing and set the next date for Dec. 16. NYPD public information officers failed to return calls requesting comment.